An account of the activity of Spanish anarchist and anti-fascist exiles in the Resistance in Nazi-occupied France. Tens of thousands were forced to flee Spain following fascist victory in the Civil War. There are many myths and controversies concerning the French Resistance during the Second World War. The "official" line, from the point of view of the Gaullists, ascribes great significance to the radio appeal broadcast by Charles de Gaulle on June 18th 1940, calling on the French people to continue the fight against the Germans. But for at least one major component of the Resistance movement the armed struggle against Fascism began not on June 18th 1940 but on July 17th 1936. It is a little known fact that over 60,000 Spanish exiles fought alongside the French Resistance, in addition to thousands of others who served in the regular forces of the Free French army. 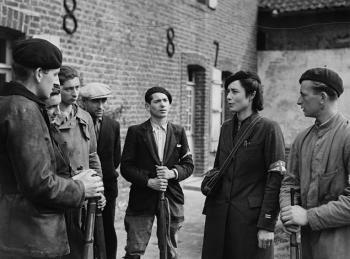 This article pays tribute to the forgotten heroes of the Spanish Resistance - in addition to the thousands who continued armed struggle against Franco in Spain - and explores the wider origins and development of the French Resistance (pictured above are members of the Maquis in La Tresorerie). Fascist victories in Spain led to several waves of refugees crossing the French border. By June 1938 some 40-45,000 refugees had crossed and an alarmed French government ordered the border to be closed. However, with the fall of Catalonia in January 1939 a human tide flowed northwards. Behind them came the retreating Republican Army covered by a rearguard composed of the 26th Division (Durruti Column) and elements of the Army of the Ebro. The right wing press in France went into near hysteria with banner headlines proclaiming, "Will the Army of Riot Reorganise Itself in France?" and "Close our Borders to the Armed Bands of the FAI (Iberian Anarchist Federation) and the POUM (a small socialist party which opposed the Stalinists)". However, with the town of Figueras about to fall to Franco, the French Left and humanitarian sensibilities prevailed and the border was opened to admit hundreds of thousands of civilians and combatants into France. The population of the Pyrenees-Orientales Department more than doubled due to the influx of Spaniards. French troops in the area had already been reinforced and further reinforcements were brought in as the 26th Division reached the border. As one of its members, Antonio Herrero, recalled,"...we were considered the most dangerous of the refugees". Sections of the French establishment clearly feared that the "Reds" and "Anarchists" would bring social revolution to France. Whilst the refugees were now safe from Franco's army, they were by no means to be allowed their liberty. Instead they were confined in concentration camps on the beaches at Argeles-sur-mer, St.Cyprien and Barcares, penned in by stakes and barbed wire. French police hunted for those who escaped confinement. Inside the camps, shelter, supplies and medical care were virtually non-existent. Strict military discipline prevailed, with frequent roll calls, patrols and constant surveillance. Distribution of left wing papers was forbidden (but not right wing newspapers). Moreover, those identified as "criminals" or "radicals" were taken to separate prison camps, such as the fortress of Collioure and the camp at Le Vernet. Here, Communists and Anarchists were held as prisoners under a regime of hardlabour. Those who experienced these camps later recalled that, although they were not places of mass extermination, in many other respects they were every bit as bad as the German concentration camps. The French government tried to encourage repatriation, both voluntarily and by threats. But by December 1939 there were still at least 250,000 Spaniards in the camps. Building work meant an improvement in conditions, though health, sanitation and food supplies were still dismal. The Spaniards organised themselves collectively as best they could through the main political groupings. With a general European war looming and recognising the vast pool of industrial and agricultural skills confined on the beaches, the Spanish exiles were given the option to leave the camps from April 1939. But this was on the condition that they either obtained an individual work contract with local farmers/ employers or enlisted in "workers companies" (labour battalions), the Foreign Legion or the regular French Army. Although the first option was the most desirable, around 15,000 joined the Foreign Legion, including elements of the 26th Division (Durruti Column) who were offered a choice between this and forced repatriation. Thus many Spanish exiles found themselves at the sharp end of Hitler's Blitzkrieg in 1940. Over 6,000 died in battle before the Armistice and 14,000 were taken prisoner. Spaniards captured by the Nazis were not treated as prisoners of war but sent straight to concentration camps, primarily Mauthausen. Of 12,000 sent to that place of murder only 2,000 survived until liberation. Other Spaniards in the French army found themselves serving in Norway, as part of the expeditionary force to Narvik and Trondheim. They distinguished themselves by their bravery, but at a heavy price. Of 1,200 only 300 survived. Following the German military triumph in Paris, 14th June 1940, the country was split into occupied and unoccupied zones. The latter, comprising central and southern France and the Mediterranean coast, was governed directly by the Vichy Government of Marshal Petain. At first many French people saw Petain as a national saviour, rescuing the country from the humiliation of total defeat. But the Vichy regime not only pursued a policy of co-existence and collaboration with the Nazis but had many of the trappings of a Fascist state itself. Petain's so-called "National Revolution" operated under the slogan "Work, Family, Fatherland" and pursued nationalist and authoritarian policies. In August 1940 all trade union organisations were dissolved in favour of the "organic" corporate structures of employers and employees favoured by Fascism. The model for these policies could be easily seen in Italy, Spain (cordial relations with Franco were quickly established) and Portugal and, as in those countries, support for the National Revolution came mostly from the upper and middle class, from small industrialists and financiers, local business and landed property and from high status professions. Such supporters were quickly installed at every level of the administration. Peasant and family life was idealised, as was the Catholic Church as a model of moral life, communal values and obedience. Youth camps and Corps were set up. And, of course, lists were drawn up of Communists, Socialists etc. - some for immediate arrest, others to be arrested at the first sign of any threat to public order. The Vichy regime was to actively collaborate in choosing hostages and recruiting labour for the Germans, arresting resisters and deporting Jews. The SS and Gestapo swiftly made contacts with French anti-Semites and Fascists, gathering information on Jews and the Left. No single Fascist style party ever emerged, partly because Hitler didn't want any basis for a resurgent French nationalism. But members of the P.P.F. Fascist party went to fight (and die) on the Russian front, and were also used internally as paramilitary units against the Resistance. But the most important formation was to be the Milice - formed in January 1943 (from the veterans association Legion des Anciens Combattants) by Joseph Darnard, Vichy minister in charge of all internal forces of law and order. The Milice, a paramilitary vanguard of the "National Revolution", became a 150,000 strong force, acting as an auxiliary to the SS and Gestapo and characterised by Vichy-style Fascism. By 1944 they were the only French force the Germans could rely on. Most surviving Miliciens were summarily executed by the Resistance just before or just after liberation. They deserved it. Many French people awoke only slowly to the real nature and ideology of the Nazi occupation and its Vichy sidekicks. Apart from a demonstration in Paris, 11th November 1940, and an impressive Communist led miners strike in the North East in May 1941, there was very little public confrontation with the Germans in the first 2 years after defeat. De Gaulle's famous radio broadcast was to be only one of several starting points of resistance. In fact, until 1942 de Gaulle was by no means a major player. Although Churchill backed him, the Americans seemed more interested in winning over French Vichy commanders in Algeria. De Gaulle was not even informed of Allied plans for Operation Torch, the landing in Algeria. He had to shift some in order to consolidate his position. To do this he sought increasing links with the internal Resistance during 1942 and had to recognise both the diversity and independence of resistance groups and the importance of the Communists as established facts. The French Communist Party had been stunned by the non-aggression pact between Hitler and Stalin in August 1939, and was then declared illegal under the Vichy regime. This meant that organisationally they played little role in the first stirrings of the Resistance, although individual grassroots militants were involved from the outset, as in the miners' strike. Only after the invasion of Russia was the CP able to regroup - but it quickly became a main player in terms of the politics, organisation and tactics of the Resistance. In its first roots the Resistance grew from the bottom up. "Early resistance was almost entirely a matter of secret initiatives by individuals and small groups...". The first act of resistance was often graffiti, for example that reversing the German declaration that 10 Frenchmen would be shot for every German assassinated ("One Frenchman Murdered - Ten Germans will Die!") or simply turning around or removing signposts to confuse the enemy. Equally important, once a group formed, was the production and circulation of clandestine pamphlets and newspapers. This propaganda built up a solidarity of attitude uniting the individual acts of resistance. These small groups of like minded individuals gradually evolved into the wider movements of sabotage and armed struggle and the more diffuse networks which ran escape routes and gathered intelligence on German dispositions. In the North they suffered severe repression from the Gestapo, but in the South the movements took on a more expansive character. This was partly due to geographical factors and partly due to the zone not being under direct German control prior to November 1942. However, there was one other vital factor - the Spanish. The Vichy regime wanted to make use of the vast amount of Spanish labour available in the South, so they established the Travailleurs Etrangers(T.E.) - basically forced labour corps of between 2-5,000 men. By the end of 1940 over 220,000 Spaniards were engaged in forced labour for French and German enterprises in France. But for the Vichy authorities the revolutionary working class history of the Spaniards posed a problem - the labour corps would provide a natural organisational focus for those intent on rebuilding their movement. And they were right - for the political organisations of the Spanish exiles were soon consolidating their position within the T.E., despite attempts by the Vichy police to identify and weed out Communists, Anarchists and "anti-nationals". The presence of this vast body of exiles, many of them hardened anti-Fascist fighters, cannot be underestimated. "Resistance was the natural state of the Spanish exiles in France. For them the French dilemma over loyalty to Petain was non-existent...". They were continuing a war that had begun behind the barricades in Barcelona, had already fought German and Italian troops in their own country, and were now about to do the same in France. As much, if not more so, than British agents of the Special Operations Executive it was the Spaniards who instructed their French comrades in armed struggle. As Serge Ravanel of the French Resistance in the Toulouse area acknowledged: "During the War of Spain our comrades had acquired the knowledge that we did not possess; they knew how to make bombs; they knew how to set ambushes; they had a profound knowledge of the technique of guerrilla war". In addition to this expertise it was said of the Spaniards that their bravery was unequalled in combat and that there was no question of treason or desertion. Within the Travailleurs Etrangers low level sabotage, the universal symbol of working class defiance, rapidly became the norm. In one incident 50 French mechanics suspected to be engaged in monkey wrenching were replaced by Spaniards. The level of inexplicable vehicle failure increased as the Spanish pleaded ignorance of the rudiments of motor mechanics. Such incidents as this were part of a wider and growing movement of sabotage, a movement that rapidly progressed to dynamiting of industrial installations and railways; grenade attacks on German military parades, canteens and barracks, not to mention individual assassinations. In a typical progression, Spanish anarchists in the Massif Central organised resistance in the T.E. corps working on a huge dam (Barage de l'Aigle). From sabotaging roads and tunnels the group eventually grew into an armed resistance battalion 150-200 strong, named after the dam. By 1942 the Resistance was firmly established, as any final illusions about the Nazis disappeared - with the SS increasingly in control in Paris; decrees demanding workers for German factories; the beginning of the deportation of Jews to the death camps and, in November, German military occupation of the Vichy zone. These events strengthened the motivation to resist and ensured a mood of protest and revolt among the French working class as a whole. By the end of the year the independent and local Resistance movements had begun to co-ordinate more closely. Previously the only movement covering both zones was the Communist led Front National established in May 1941. Its armed wing was the Francs-Tireurs et Partisans Francais. Other groups combined to form Mouvements Unis de Las Resistance (MUR), whose armed wing was the Armee Secrete. The MUR recognised de Gaulle as leader but the Communists retained their independence. Both groups formed part of the Comite National de la Resistance (CNR). It was through the CNR and MUR that de Gaulle was able to cement his position inside France. Arms supplies from London and Algiers went to groups which recognised his leadership and accepted a degree of tactical control from the British SOE. The guerrillas of the FTPF were left to arm themselves with weapons captured from the Germans or by intercepting Allied supply drops intended for the Armee Secrete. Alongside political differences, there was a difference over tactics. The Armee Secrete argued that the Resistance should hold itself in readiness to support an Allied landing. The FTPF argued for an immediate campaign of harassment, sabotage and ambush of German troops. They also wanted to assassinate individual German officers, a tactic de Gaulle rejected. The Spaniards, primarily active in the South and South-East, organised themselves, although some individuals fought in French units. Spanish formations were recognised as an independent but integral part of the French Resistance within the CNR The main grouping was the Communist led Union Nacional Espanola (UNE) formed in November 1942. In 1944 its name changed to Agrupacion Guerrillera Espanola. A second organisation, the Alianza Democratica Espanola, rejecting Communist control, was formed by the Anarchists (CNT/FAI); Socialists (UGT/PSOE); Left and Independent republicans and Basque and Catalan nationalists. The critical moment of expansion for the Resistance came in 1943 with an influx of new recruits fleeing forced labour. In June 1942 a decree had been issued requiring French workers for German factories. This was extended in February 1943 with the setting up of the Service du Travail Obligatoire (STO) to meet the ever increasing numbers demanded by the German labour ministry. The STO was resisted by individual evasion, strikes and even angry crowds freeing arrested workers from the French police. It also proved the vital ingredient in the formation of armed groups in the countryside, the Maquis. Between April and December 1943, 150,000 workers were on the run from the STO, and by June 1944 this had swelled to more than 300,000. The Resistance movement encouraged non compliance and supplied shelter, supplies and arms to the evaders who took to the hills and countryside. The Maquis were supported by the rural population - alienated by constant requisitions of produce and the imposition of the STO on agricultural labourers. This swelling of guerrilla strength in the countryside throughout 1943 inaugurated a new and more ferocious phase of armed struggle, which in the conflict between the Milice and the Maquis increasingly took the form of a civil war. Whilst the long term plan was to prepare a national insurrection in support of the expected Allied landings, there was disagreement over the best tactics to employ in the meantime. Some favoured massing in large formations, in effect local insurrections. Others argued for small mobile units of 20-30 men as the only viable tactic. The latter was undoubtedly the right policy. On three occasions when the Resistance in the South did mass for conventional warfare, on the Plateau of Glieres; at Vercors and at Mont Mouchet they were both heavily outnumbered and outgunned by the Germans. Spaniards participated in these actions, but had warned against them - knowing full well from the war against Franco that lightly armed troops could not engage in conventional warfare without armour, artillery and air support. Despite these setbacks resistance in the 18 months before D-Day inflicted massive damage on infrastructure and tied down German troops across France. The Resistance could far more easily neutralise railways, industrial sites and power stations than Allied air power, and their intelligence networks, at first lightly regarded by the British, were of decisive importance. Between June 1943 and May 1944 nearly 2,000 locomotives were destroyed. In October 1943 alone, over 3,000 attacks were recorded on the railways, 427 resulting in heavy damage, with 132 trains derailed. In the South West such sabotage was so effective that by June 6th 1944 it took 3 days to travel from Paris to Toulouse! Whilst the guerrillas were less numerous in the North, between April and September 1943 some 500 resistance efforts were recorded, 278 against railways and other infrastructure, killing 950 Germans and injuring 1,890.In Normandy and Brittany, Spaniards blew up electrical transformers, a railway station and switching yard and part of an airfield. Spanish resistance fighters in Paris assassinated General von Schaumberg, commandant of Greater Paris and General von Ritter who was responsible for the recruitment of forced labour. The effectiveness of the guerrilla campaign was to lead Eisenhower to comment that the Resistance effort around D-Day was worth a full 15 regular army divisions. Likewise Maquis support of the northern drive of the American 7th army was estimated as worth 4 or 5 divisions of regular troops. It should also be remembered that Allied troops never entered the South of the country. The whole area west of the Rhone and South of the Loire rivers was liberated by the national insurrection of the Maquis, as also was Brittany, save for the Atlantic ports with their strong German garrisons. In the Department of L'Ariege the 14th Spanish Corps of Guerrillas (reformed April 1942) played a key role in evicting the Germans. Between June 6th and August 1944 they attacked German convoys and liberated several villages before taking Foix, the Nazi HQ in the area. A strong German column attempted a counter attack but were caught in an ambush. Despite their logistical superiority they were pinned down by machine gun fire and 1,200 surrendered. A key role was played by a solitary machine gunner who held his post raking the Germans with bullets. One resistance fighter recollects this man, "firing like a crazy one", and adds, as if by way of explanation, "...but he was a Spaniard, a guerrillero". Allied observers of the engagement commented that the Spaniards were "uniquely perfect guerrillas". Other examples of the Spanish contribution include the Anarchist Llibertad battalion which liberated Cahors and other towns and the participation of 6,000 Spanish guerrillas in the liberation of Toulouse. One notable encounter occurred as the Germans attempted to withdraw through the Gardarea, following the fall of Marseilles. A group of 32 Spaniards and 4 Frenchmen tackled a German column (consisting of 1,300 men in 60 lorries, with 6 tanks and 2 self propelled guns), at La Madeiline, on August 22, 1944. The Maquis blew up the road and rail bridges and positioned themselves on surrounding hills with machine guns. The battle raged from 3pm till noon the next day. Three Maquis were wounded, 110 Germans killed, 200 wounded and the rest surrendered. The German commander committed suicide! Over 4,000 Spaniards took part in the Maquis uprising in Paris that began on August 21st 1944. Photographs show them armed and crouched behind barricades in scenes one could easily mistake for the street fighting in Barcelona in July 1936. Before long they were supported by regular troops from the Normandy beach-heads. The first units to enter Paris and reach the Hotel de Ville were from the 9th Tank Company of the French 2nd Armoured Division. But the lead half tracks bore the names of Spanish battlefields -"Guadalajara"; "Teruel"; "Madrid" and "Ebro". They were manned by Spaniards, of whom there were 3,200 serving in the 2nd Armoured. Many of these were veterans of the 26th Division (Durruti Column) who had entered the French army from the prison camps in 1939 and gone on to fight in North Africa. Captain Raymond Dronne, commander of the 9th Company, remembers that the Spanish anarchists were "both difficult and easy to command". In accordance with their libertarian principles "...it was necessary that they accept for themselves the authority of their officers ... They wished to understand the reason for that which was asked of them". However, "...when they granted their confidence it was total and complete". "They were almost all anti-militarists, but they were magnificent soldiers, valiant and experienced. If they had embraced our cause spontaneously and voluntarily it was [because] it was the cause of liberty. Truly they were fighters for liberty". The 9th Company featured prominently in the victory parade through Paris with its tanks drawn up at the Arc de Triomphe. They went on to see action on the Moselle and were the first to enter Strasbourg, supported by American infantry. Their campaign ended in Germany at Berchtesgaden, Hitler's "Eagles Nest". Having fought from the streets of Barcelona, across the battlefields of Spain, North Africa and France they stood as victors in the final bolt hole of the Nazi scum. Liberation saw a brief period of euphoria, with the Resistance bridging the vacuum of power in the South - dealing with collaborators and remnants of the Milice; setting up local committees to administer supplies and re-establishing communities on a more equal footing. Ordinary men and women were momentarily in charge of their own history. But this was not to last. De Gaulle and his allies had no desire to see Southern France controlled by revolutionary elements. The Maquisards represented a threat because "an army of guerrillas is always a revolutionary army." De Gaulle feared for revolution in Toulouse where 6,000 Spanish guerrillas were "...still imbued with the revolutionary spirit they had brought from beyond the Pyrenees" .To deal with this explosive situation the Maquis were offered the choice of disarming or joining the regular French forces for the attack on German garrisons in the Atlantic ports. This would show America that there was a regular national army and no need for Allied occupation, and it would also remove the armed bands whilst a smooth transference to Gaullist power took place. This was easily achieved because de Gaulle had cemented his position in key sections of the Resistance by control of the arms supply. In all 25,000 Spaniards had died in the camps or fighting in armed units. With the German surrender in 1945 the Spaniards believed, understandably, that the Allies would turn their attention to Franco and that, without German and Italian support, he would be swiftly crushed. In fact many had been fighting all along in anticipation of returning to Spain for some unfinished business. Anti-fascist guerrilla activity had continued in Spain throughout the war. Meanwhile, exiles in Algeria and France had been preparing for a return - stockpiling arms "borrowed" from American depots. Likewise, as the French 2nd Armoured Division advanced north from Paris, its 9th Company was secretly joined by six members of the Durruti Column who had been with the Resistance in Paris. Whilst fighting alongside their old comrades in the 9th Company they hid arms and ammunition from the battlefields in secret caches. These were later collected and taken to Spain. 1945 saw Franco very much alone, condemned by Britain, Russia and the USA and excluded from the United Nations. The British Labour government, prior to their election in 1945, had promised a quick resolution to the Spanish question. But sadly history proved that the British were not to be trusted. The Labour government, despite its promises, used delaying tactics in the United Nations to stop effective action, arguing that it was purely an internal matter of the Spanish people and that they had no wish to "permit or encourage civil war in that country". Economic blockade and international isolation would have finished Franco off within months - but Britain and US would not support this; despite protestations from other countries who favoured, if necessary, armed intervention. For the British and Americans, as in 1936-1939, the real problem was not Franco but the possibility of a "Red" revolution of the Spanish working class. This attitude solidified as the Cold War developed. A gradual rehabilitation of Franco took place, ending in full recognition and incorporation into the United Nations in 1955. Fascist Spain took its place at the table of the not so new world order. Even in 1945, whilst some continued to believe that diplomacy would restore the Republican government, many militants opted to renew the armed struggle. Between 1944 and 1950 approximately 15,000 guerrillas fought in Spain, bringing half the country into a state of war. But, despite strikes in Barcelona and the Basque areas, involving over 250,000 people, the population as a whole, wearied by war and repression, were not prepared to rise, or had placed their faith in the diplomacy of Western "democracies". The guerrillas were left to fight alone and inadequately armed against Franco's impressive police and military apparatus, which was always well supplied with intelligence on guerrilla movements from the other side of the French border. It was an unequal struggle. As Juan Molina lamented: "The prisons consumed a generation of fighters, defeated this time irremediably ... All strength in life has its limits and this limit was amply exceeded by the Resistance, in almost inhuman endurance. But it had to succumb". These working class militants, who bore arms for ten or even twenty years against fascism and capitalism, deserve far more than just remembrance, though even that has been denied them. The struggle for which they gave their lives has not ended - it falls to us to continue that struggle and keep alight the flame of their resistance. Edited by libcom from Fighting Talk, No. 15.